I've finally dried out from last week's bike to work day. I knew heavy rains were predicted for the morning and had resigned myself to missing out this year. As I lay in bed listening to what sounded like buckets of water being thrown on my roof, I got on Twitter and saw there were a handful of intrepid Arlingtonians already out there braving the elements. After languishing in bed for nearly an hour I heard the rain slowing down and thought, I could at least bike to Ballston and claim my T shirt at Fresh Bikes. I donned my rarely used rain pants, my cheap red rain poncho, and pulled the rain shield over my backpack. Wool socks and my oldest shoes completed my ensemble. Halfway to Ballston the light rain - I should have known it would - picked up. But my spirits lifted when I high-5'd the WABA (Washington Area Bicyclist Association) greeter standing at the entry to the pit stop. There was less swag than last year, a casualty of the weather. I had hoped to snag another free reflective vest (having given away last year's) but I did pick up some reflective leg bands and, of course, breakfast. 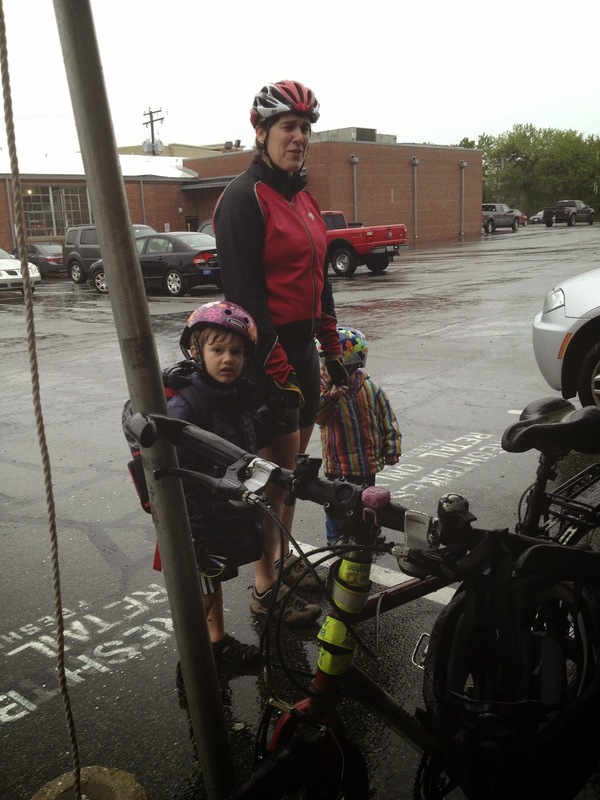 And I got to see the cutest biking family, decked out in their adorable rain gear and nutcase helmets. Since I was thoroughly soaked, I figured I'd take my commute one metro stop at a time. By Rosslyn, I decided I'd done a respectable job, parked my bike, and took metro the rest of the way to work. Looking somewhat like a big drowned rat, my drenched feet bore the brunt of the wet weather. It felt like I was walking through squishy mud, which actually was rather pleasant. 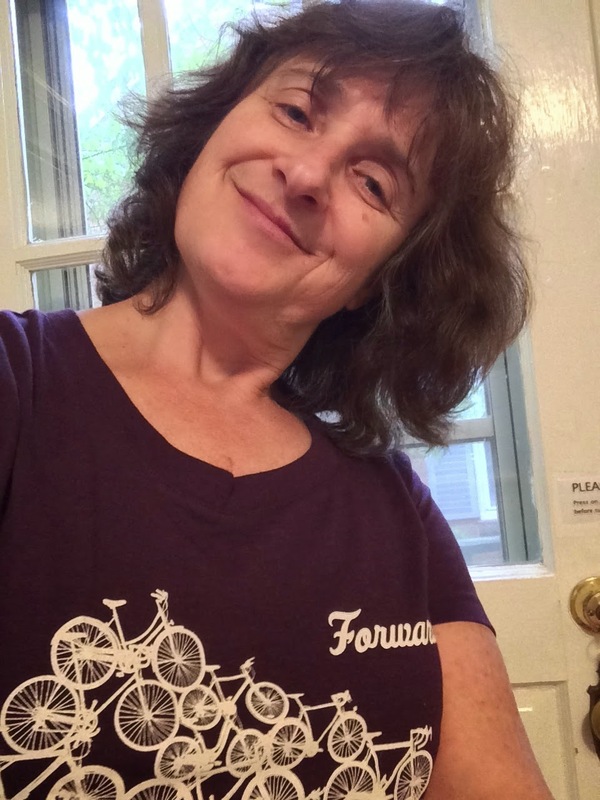 Over the lunch hour, I wore my Bike to Work Day T shirt to the gym for Pilates. A fellow student gave me my second high-5 of the day and said she had done the same thing – biked part way, took metro for the rest. Our teacher was amply impressed by our efforts, but did not go easy on our abs! By then the day had turned brightly sunny, evaporating the memory of the soggy morning. My non-biking friends cemented their view of me as a cycle fanatic. 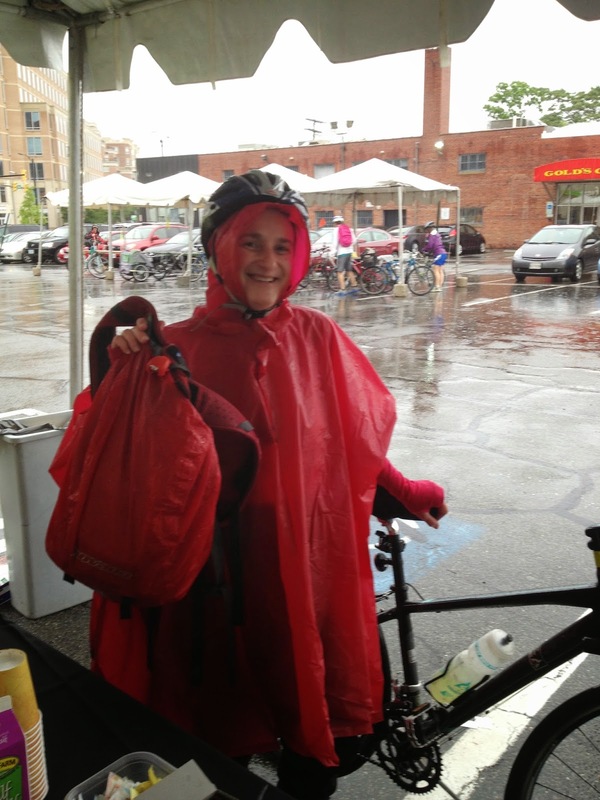 But for me, it was a reminder that riding in the rain can be fun, once you’re resigned to getting wet. I came home to copies of the Wisconsin Bicyclist Federation’s April magazine that printed my essay about childhood biking, Lost in Milwaukee. It’s awfully nice to see my work in print, and they included some lovely photos. They also sent me a very stylish T shirt in my favorite color, just in time for me to wear on my upcoming visit to the Dairy State. 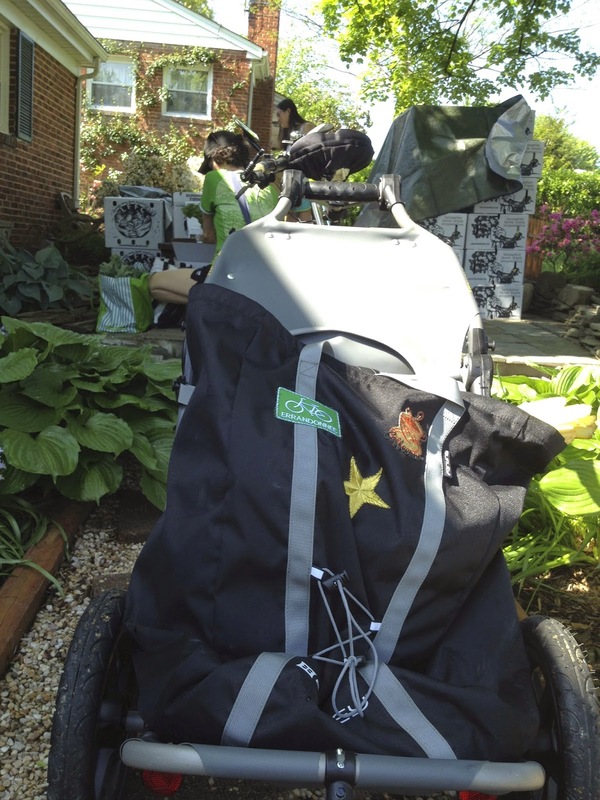 One final photo – last week I made my first CSA pick up of the season, using my Burley Travoy, of course, now emblazoned with its magnificent winter 2014 Errandonneee patch. Ah, livin’ the bike life! I’m going to quickly skip past the embarrassing fact that I rode my bike some 20 miles with a flat tire, wondering what that thumpa-thumpa-thumpa sound was. I thought, gee, the Capital Crescent Trail is rough. So, despite having totally ruined the tire (and tube) the wheel was fine and it turned out I was due for a new set of tires anyway. My bike was just at its 2-year anniversary and I was proud to have worn through the first set, thanks to all the happy miles the bike and I had shared. Mid-April I had a trip to New York. 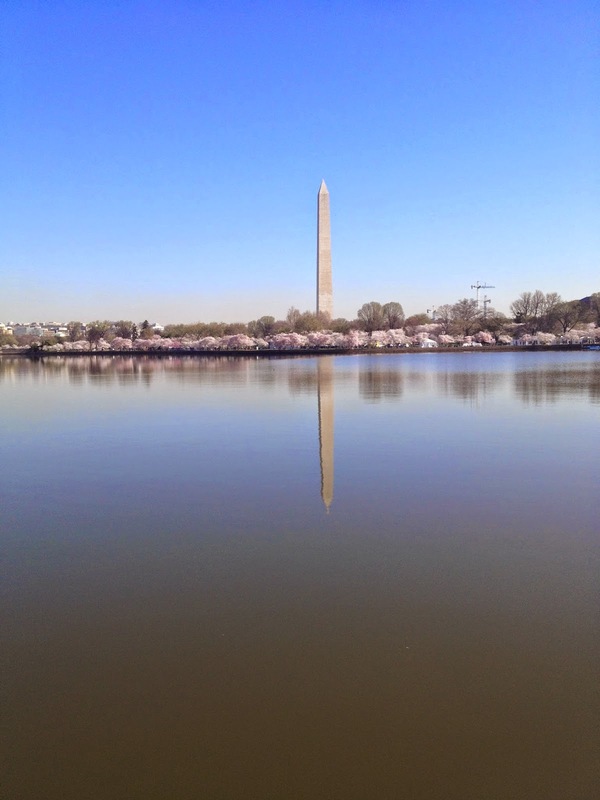 Knowing that the cherry blossoms were at their peak, I left home early, rode past the tidal basin to see the delicate pink wonder, and then on to Union Station, hauling my weekend gear in my trusty Burley Travoy. 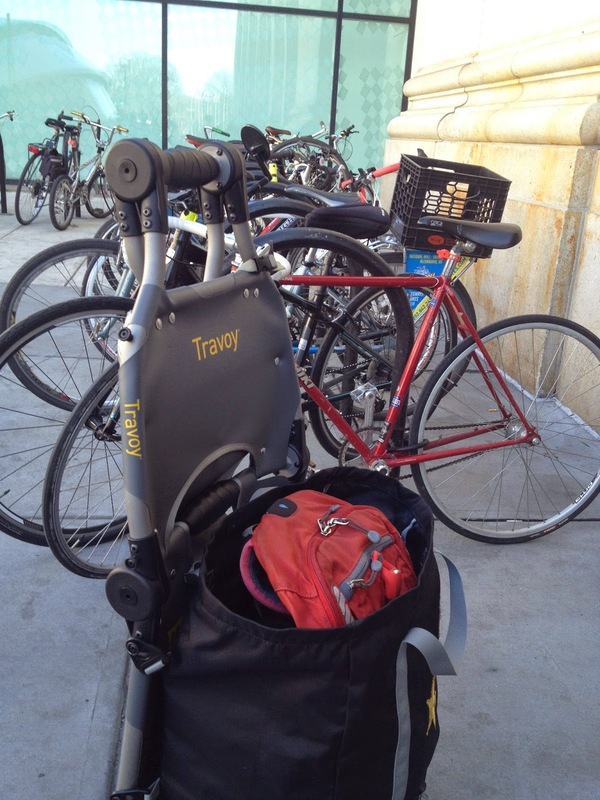 I think it was the Burley’s first trip on Amtrak, and I was glad to accept help getting it up the steep steps of the train. But it fit nicely in the overhead compartment, so I wouldn’t hesitate to take it on Amtrak again. 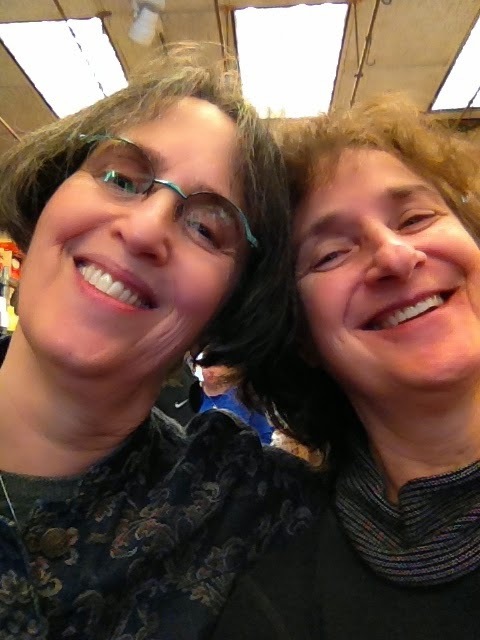 After spending a fun-filled long weekend with my cousin – art, family, theater, food – she left for the airport and I had a couple hours till my train. I stashed my bag and took the hotel’s free bike for a spin. 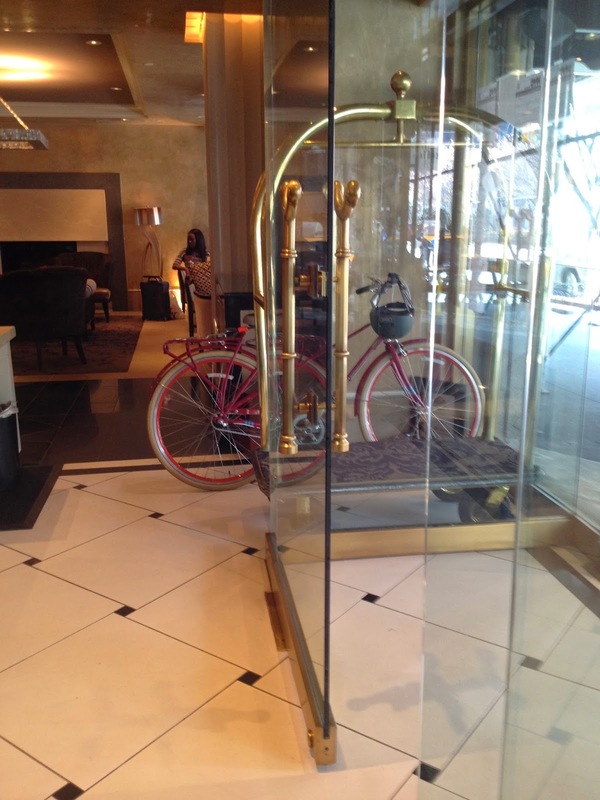 Yes, I said free bike – since I try to stay at Kimpton hotels – in support of their bikes-for-guests policy. I headed for the west side highway path, taking it south. I’d wanted to loop the southern tip of Manhattan and come back up the path on the east side. But I hit a construction detour and wasn’t sure I’d have time to navigate. Not wanting to take the boring option of returning the way I’d come – I made the bad choice of cutting cross town through the West Village. Can you say cobblestones? But I made it over to 1st Avenue, knowing there would then be a nice protected bike lane (see the link - it came in #6 of the top 10 in 2013 - ok they didn't feature the section I was on - but it's still great) to take me back up to my hotel at 38th Street. Other Amtrak passengers may not have appreciated my no-time-to-shower dishevelment (not to mention smell) both directions. But, then again, I couldn’t have smelled worse than the typical Amtrak quiet car…just different. A few weeks later, on Easter Sunday, I pulled out my cute but impractical hat helmet. It’s not as comfortable as I’d like, but for my trip to Trader Joes’s I figured it was the one day of the year I could wear it without feeling self-conscious or pretentious. (I took a selfie, but it seems to have disappeared.) 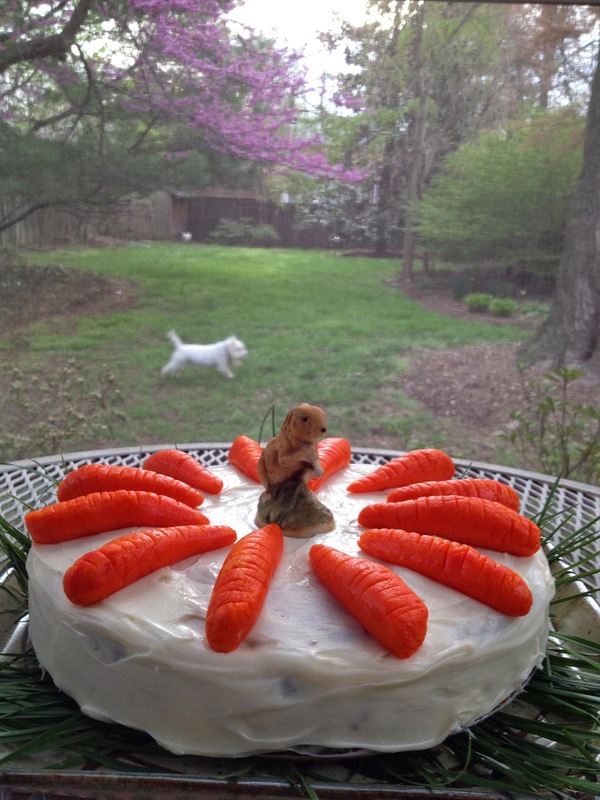 I made a belated 21st birthday cake for my child, and was quite delighted with the results – carrot cake with marzipan carrots on top. At last it's May, and I'm savoring the days when it’s sunny and cool, but not cold – the perfect riding temperature in my book – knowing that all too soon, I’ll be complaining about the heat.